Light vanilla creamy centre with a hint of caramel covered with crispy chocolate and lightly dusted with icing sugar. A devine treat. 150gr box contains 11 large truffles. Light mocha creamy centre with a hint of caramel covered with crispy chocolate and lightly dusted with icing sugar. A nice treat. 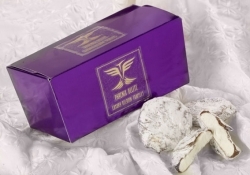 150gr box contains 11 large truffles.